EURUSD managed to stay in the green for the second consecutive week even if it could not retain Thursday’s gains above the 1.15 level. The RSI seems to be heading towards its 50 neutral mark, while the red Tenkan-sen line continues its sideways move below the blue Kijun-sen line which is also flat, all reinforcing a neutral view for the short term. The 1.1400 mark could be of psychological significance and therefore a potential support level to keep in mind in case the pair extends declines below the 38.2% Fibonacci of the downleg form 1.1814 to 1.1214. Slipping lower and breaking the 50-day simple moving average (MA) currently at 1.1390, would open the door for the 23.6% Fibonacci of 1.1356. If negative pressures become even stronger, attention would shift towards the 1.1300-1.1265 restrictive area, where the price bottomed several times in the past few months. On the upside, the 50% Fibonacci of 1.1515 appeared a heavy obstacle for the bulls and therefore could gather extra attention when the price potentially rebounds. Traders, however, would like to see a strong rally above the 200-day MA (1.1556) to turn more confident. Should the price jump above that line for the first time after eight months, surpassing the 61.8% Fibonacci of 1.1585 as well, then the pair could pick up steam towards the 1.1640 area. Higher, the 1.1730 level may be the next resistance to watch. 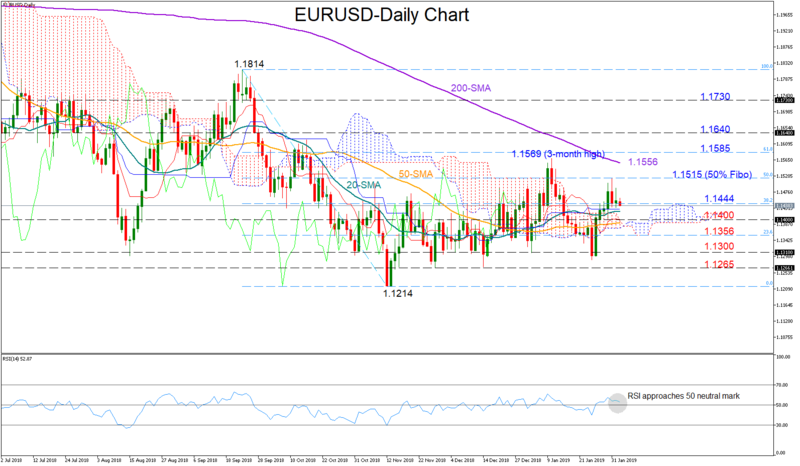 Turning to the medium term picture, EURUSD maintains a neutral outlook, trading between 1.1569 and 1.1214 over the last three months. The lack of momentum in the 50-day MA could be a sign that the neutral profile is not likely to change anytime soon.